I snapped the photo in our hotel room during the Capitol Region GB Fling. 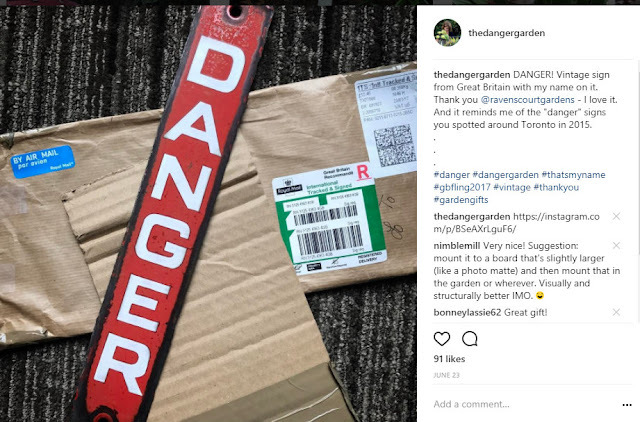 The kind Laurin Lindsey of Ravenscourt Gardens had spotted these vintage DANGER signs on Etsy and purchased one for me. It was Andrew who suggested I take advantage of the fact the sign is metal, and use magnets to attach it somewhere. I like the fact it's not permanent and I can move it if the mood strikes. Although for now this just feels perfect. Metal is certainly a consistent theme throughout the garden. Earlier this summer I found a online supplier for custom cut galvanized steel and ordered a top for this cheap IKEA table. I have no idea what this little metal piece was supposed to be (picked up at the ReBuilding Center), but naturally it became a planter. While I was immediately drawn to its shape, it took Andrew to point out its similarity to our oval stock tanks. Empty wasps nests (the brown bit is a resurrection fern, in need of resurrection). And the Eucalyptus button came from a garden in California. One of the gifted Tillandisa I received a few weeks ago is blooming, wait I'm repeating myself. I shared that a couple of days ago on Bloomday didn't I? They're looking good. Although the big one on the right has lost some of its purple color, since it's in so much shade. Bummer. The hanging containers...I decided to try Dichondra argentea in this (oddly shaped) chartreuse pot. The painted ferns are still doing well in the orange Hover Dish. And the orange circle pot got a mix of Bromeliad and Tillandsia this year. It's a pity this photo doesn't really show the remarkable color of that Bromeliad. But then again this post was supposed to be all about the DANGER sign...I just tend to ramble. The DG is indeed looking shiny, and that sign is too cool. How is it that guys always seem to think of stuff like using magnets? Brilliant. Loved your garden ramble as I am working on something similar. As I was taking pix, I kept wondering if I hadn't just done that same thing. When you post as much as we do, sometimes it gets a bit confusing. How thoughtful of Laurin! The sign is great and your placement is impeccable. I quite enjoyed the ramble in your garden. The metal top for the Ikea table is inspired. Love the way you use found objects! Thanks Peter, I'm wondering if I haven't hit a metal tipping point though...too much of a good thing? Jeez, I was all set to comment on your beautiful pots and seedpod arrangements and your fun Danger sign (brilliant idea to attach it with magnets to that pot), and then I saw your weather report and fell into a funk of green-eyed envy over your summer high temp of 81 degrees. I've all but abandoned my poor garden since the Fling because it's just too dang hot to be out there. Welp, it's almost time to hit the road for our annual summer escape to cooler climes, and as you know, Portland is on our route this year. Cannot wait! We're all pretty thrilled with the weather we've been having, pure summer perfection (maybe a "payback" for the abysmal winter we summered through). As I scrolled thru your post, the old tune 'Heaven, I'm in heaven...' started running through my brain. Orange, metal, T's and Bromeliad's, every detail is perfection. You made my day! Ah Sheila, you're so generous with the compliments - thank you! So please you found the right spot. Got the sweet thank you card today : ) Brilliant Andrew's suggestion to use magnets! Your garden always inspires. I love the hanging pots and their plants,never thought of putting a Painted fern in a hanging pot...to cool and the Dichondra argentea in the cool chartreuse pot, wow! Magnets! I love that you can move it around as the mood strikes. Glad to see the happy Cryptanthus babies! And all the other beautiful bromeliads. Facebook has spoiled me. I need my drooling face emoji. It's kinda freaky how we've all been trained with FB's reactions. I know I look for the "like" button more often than I care to admit. Love the magets and the pots and all the metal. Plus filled with such cool plants. Your patio-scape is just as wonderful as your many mantle-scape creations. The area looks like the perfect place to while away a summer afternoon - but how often do you do that? Well not very often, and not for why you think! I prefer the semi-sunny patio chairs. Andrew's the shade king. Cool stuff. The sign is perfect, and so is that fabulous Cryptanthus. That striped one still makes me swoon every time I look at it. I feel so exonerated..I have a 'nature' table in my family room, just inside the door to the back garden. It has birdnests, wasp nests, artichokes, driftwood etc etc. We can't help ourselves can we? That is such a cool sign - how kind of Laurin! A perfect gift and it looks awesome on the metal planter. Somehow I don't remember so many bromeliads before, the colors and textures look great with your planters. I love the red accent pieces on your patio, especially the table! OMG, stop. The perfection is making me so jealous. My garden is full of weeds and a big ugly pile of gravel that refuses to spread itself. How is it that you pick up bits and pieces that would, in most hands, amount to clutter and it all comes out looking elegant and posh? Because my camera doesn't show the clutter? Perfect!! I marvel at your garden, so many interesting things to see. Thanks to the generosity of Laurin we all had a peak at your lovely and perfectly styled sitting area. A captivating display of magnolia cones and other treasures. I love it! It IS so YOU. I just love your gardens, as you know. I want to be a gardener like you when I grow up!